Low interest rates coupled with lower-than-usual home inventory has created a market where newly listed homes are selling like hotcakes. Consequently, these newly listed homes often receive multiple purchase offers, which is excellent news for sellers. But for buyers, having multiple offers is not excellent news. If you’re getting involved in a situation where your offer may be one of many, it’s vital to have a great real estate agent representing you who has experience with multiple offer situations. 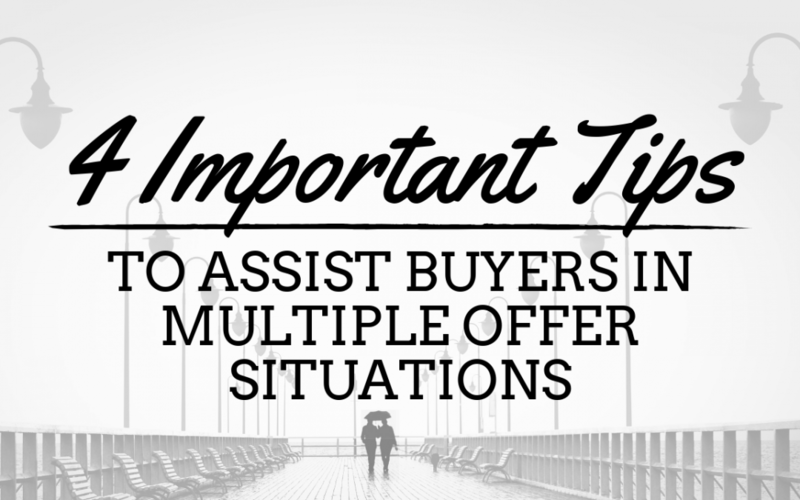 Here we share four important tips to assist buyers in multiple offer situations. In a multiple offer situation, don’t low ball! Yes, it’s frustrating to lose out on a home, but expecting a low ball offer to be accepted is just wishful thinking. If you’re in love with a home and there are multiple offers, you need to know that you’ll only have one chance at scoring the house. If you require seller contributions, you need to be aware that it’s a “give-and-take” situation. If you need $5,000 in seller contributions, don’t expect to offer $5,000 below the listing price and also get the contribution from the seller, especially in a multiple offer situation! If you absolutely need seller contributions, consider offering above the asking price, keeping in mind the home needs to appraise for the purchase price. You have the option to make a purchase offer contingent on several different items, and some are more common than others. In a multiple offer situation, not having as many contingencies can make one offer more desirable to sellers than the next. While it’s not recommended to waive the opportunity to perform a home inspection, some sellers will just eat that up. The purpose of a home inspection is to ensure the home’s current state for the buyer. By waiving a home inspection, the seller is now “off the hook” for any repairs that would be requested after an inspection of the home. This doesn’t mean you shouldn’t have a home inspection completed—you just don’t have to leave the seller on the hook for repairs. There is a major difference between being pre-approved and pre-qualified! Understanding the difference is extremely important. A pre-qualification is when a lender looks at your financial picture based on what you tell them. In most cases they will look at your credit information to make sure your credit scores are in line with the current mortgage guidelines. The lender will then issue a“Pre-Qualification” letter, subject to verification of information once you apply for a mortgage. A pre-approval is a little more involved but is much more desirable when it comes time to negotiate on a home. Getting a pre-approval includes a lender pulling your credit report, collecting pay stubs, bank statements, W-2′s, etc. and actually confirming your employment status. Most pre-approvals are as good as a mortgage commitment, and are generally only subject to an appraisal being done on the property. Putting a large percentage down towards a home can give you a distinct advantage. Although the amount of the deposit can vary, a larger deposit can indicate your serious intent to purchase the home to a seller and can also indicate your strength. In case you missed it, check out our last Title Junction post: What’s a Credit Score? A credit bureau score, or “credit score” is a number based upon your credit history that represents the possibility that you will be unable to repay a loan. Lenders use it to determine your ability to qualify for a mortgage loan, since they’re not really in a position get to know you to judge your character. Hard inquires occur when a lender reviews your credit score, and can potentially have a negative effect on it. Soft inquires, on the other hand, occur when you check your own credit score and don’t have a negative effect. In a nutshell, the better your score is, the better your chances are of getting a favorable loan, since lenders will take that to mean you have a pretty good track record of repaying your debts. Make sure you know your score and ensure that lenders have current information about it. The closing process of a Cape Coral or Fort Myers real estate transaction is complex, requiring the cooperation and coordination of all parties involved. At Title Junction, we have the experience and know-how needed to make sure the you get from contract to closing table in an efficient and timely manner. The process begins when we received the sales contract or title order. This is when the count-down to closing starts. From this point, timelines and document preparation become a key component to closing the transaction. The next step is to conduct a detailed search of county, state and federal records. After we review the search, we prepare a title commitment that is sent out to buyers, sellers, realtors and lenders. Communication is a vital part to closing any transaction. Next, our staff obtains all the necessary documents and information to get to the closing table. There is crucial information that must be obtained from the buyer, seller, real estate agents, lenders and any other professionals involved in the transaction. Examples of this would be obtaining mortgage payoffs, current taxes, homeowner association fees and any other lien or assessments. We work closely with the buyer, seller, realtors, and the bank to make sure that all parties involved receive all of the information they need in a timely manner. We communicate with each party involved in the transaction to make sure that everything comes together seamlessly, and nothing falls through the cracks. We also order additional services if they are required or requested such as inspections, appraisals or surveys. For instance, most lenders will require that a survey be done. However, if there is no lender, a survey is not required but the buyer could still request to have one done. As soon as all the necessary information and numbers from the lender are collected, we prepare the Settlement Statement showing the breakdown of fees, costs, charges and credits. We provide this to all parties as early as we can so they may have a chance to review the Settlement Statement so there are no surprises at the closing table. You may also hear the terms; HUD, CD or Closing Disclosure. Before closing, we update the title work and we check for any information that may need to be updated or is required to be updated. Then, a final review is conducted by one of our settlement agents and once they are satisfied that all documents are in order, the date and time is scheduled and confirmed with all parties. Now it is finally time to close your real estate title. 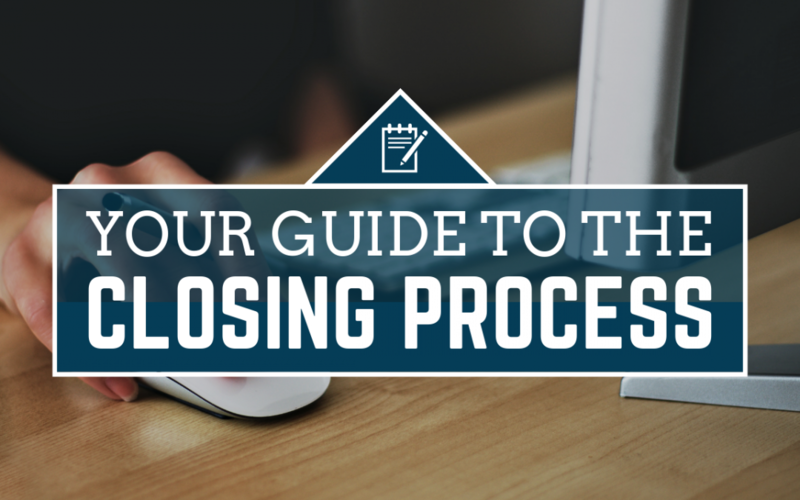 At closing, we explain all the documents, including everything on the Settlement Statement. We also answer any questions and get any additional information that may have been requested by any of the parties. Immediately following the closing, we have all the necessary documents recorded in the county clerk’s office. When the documents are returned to us, we issue the owner’s policy and send it, and the original deed, to the owner. We also send the lender’s policy and the original mortgage to the lender. 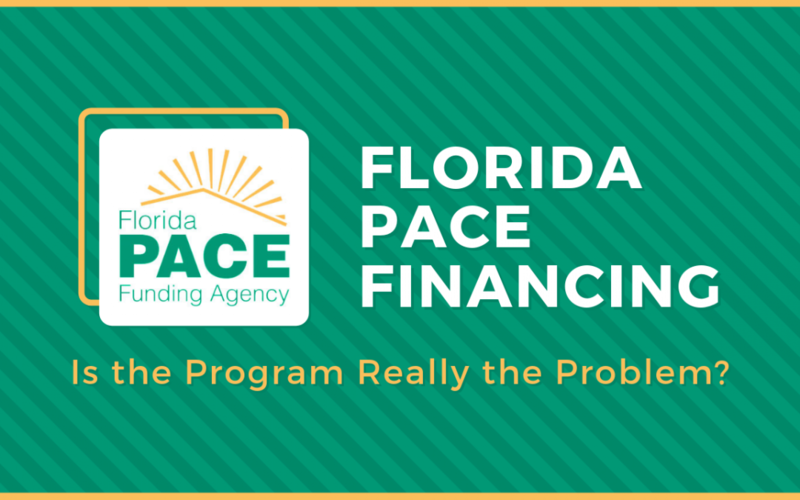 Florida PACE Financing: Is the Program Really the Problem? Recently, Collier County has been seriously considering pulling the plug on the PACE program for homeowners. Property Assessed Clean Energy financing is a statewide program in Florida that local governments can choose to opt in to for their citizens to use. The general gist of the program is that it makes it easier to obtain loans for specific energy-saving and weather-resistant home improvements like solar panels, new air conditioning systems, and storm windows, to name a few. No credit checks or money down are required, and it offers a fixed rate of interest. All that is required is proof that you’ve been making your mortgage payments on time and that you make enough money to make payments on the debt. Unfortunately, many homeowners are duped into thinking the loan is actually a free handout; or at the very least, interest-free. Then they’re hit with the true cost of the improvements made to their homes—which generally needs to be paid back monthly over a 20-30 year period—and they simply can’t keep up with the payments. If this happens, a lien is recorded against the house, and an unpaid lien makes the house extremely difficult to refinance or sell since the lien would show up in any title search conducted, and it has to be paid off before anything else, even the mortgage. Failure to make payments can ultimately cause the homeowner to lose their home, along with all of its nifty new improvements. Because of these unfortunate incidents, Collier County is looking to eliminate individual homeowner access to the PACE program altogether and follow Lee County’s example of only making PACE financing available to business owners. This is likely due to the fact that businesses are more thorough with checking all aspects of a program before signing up, since they see it as a business transaction from start to finish. To be clear on one thing; there’s nothing wrong with the PACE program itself. In fact, it’s a great program since it makes loans for home improvements accessible to people who might not qualify otherwise. The problem is that the terms of the loan are misconstrued to individual homeowners, usually by a few bad-seed contractors who are hired to make the improvements to the home. In the end, the problem with the PACE program lies in a lack of education. Homeowners who want to sign up for PACE financing should be given all of the facts in an easy-to-understand format, not bombarded with pages of legal jargon that practically requires an attorney to interpret. There are many reasons for why closings can be delayed. Maybe the home inspection turned up something concerning. Or perhaps your title company found an undisclosed lien on the house. Either way, it’s bound to be an inconvenience when people buy or sell in a simultaneous transaction. And for those who have already moved out of their previous home and hedged all of their bets on moving into their new abode right after the closing, the inconvenience is automatically upgraded from minor to major. Individuals with a flair for the dramatic tend to jump straight into the assumption that they are now “homeless.” While that’s certainly an eye-catching post to shock Facebook friends, it’s not necessarily true. 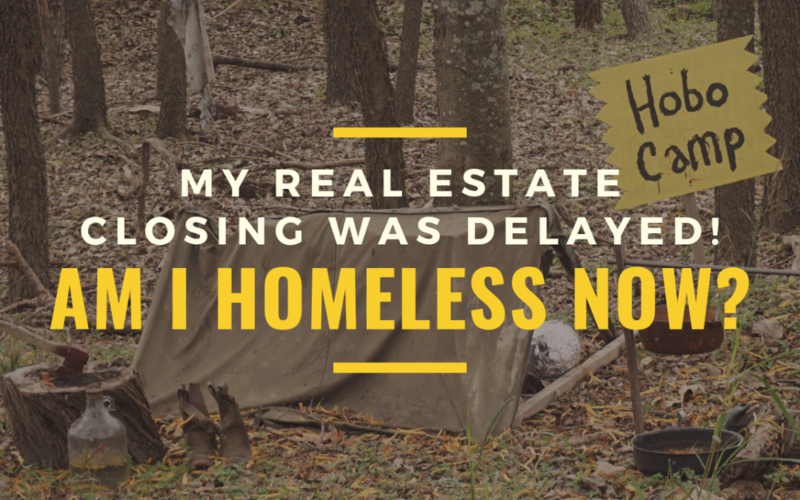 True homelessness is vastly different from not being able to close on your home for a few days. In other words, if you have the means to put a roof (temporary though it may be) over your head without the help of non-profits or the government, you’re not actually homeless. You can apply or submit your information in writing or orally. So long as your live conversation or phone call is backed by a written record, your application will be legitimate. If your loan is approved once the 6 key pieces of information are submitted, a creditor MUST supply a loan estimate within 3 business days, meaning you’ll get your results much faster if you apply earlier in the week. In case you missed it, check out our last Title Junction post: What Does Title Insurance Even Do? Title Insurance is an enigma to many homeowners, leaving you to wonder “Do I even need it?” Homeowner’s insurance obviously covers you if anything bad happens to your new home like a fire, so what’s the use of title insurance if your home is already protected? While your home might be protected from physical damage, homeowner’s insurance does nothing to protect you from outright losing ownership to your home. 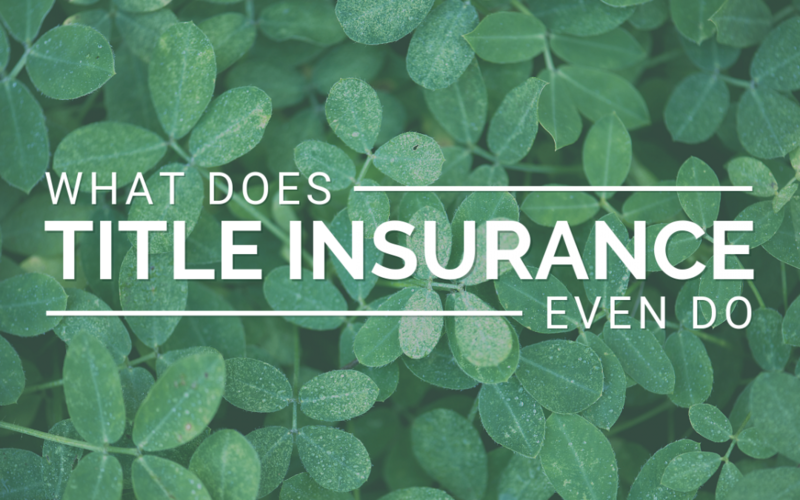 That’s where title insurance kicks in—it insures the title to your home. There’s a reason you’re required to have lender’s title insurance when you take out a mortgage; your lender is completely aware of the risk of problems occuring that could challenge your claim to the title. However, lender’s insurance only protects the lender against title challenges; it doesn’t insure you or your heirs in the event of a defect in the title (including but not limited to unpaid bills for labor and material, forgeries, missing heirs, unpaid mortgages, unpaid taxes, etc.). If you want the same protection for yourself, you’ll want an owner’s title insurance policy, which is a one-time fee and is good for as long as you or your heirs own the property. What if the people signing the deed are not really the owners? What if someone claims to have a lien on the property and demands that you pay it? How much will it cost in legal fees to defend your rights? How can owner’s title insurance protect me? Ultimately, it’s your choice whether or not to get owner’s title insurance. But one thing is for sure—it certainly never hurts to have an extra layer of protection on one of your most expensive investments. House hunting is an exciting undertaking. After all, you’re choosing the place your family is going to call home! However, the process is a bit more complicated than shopping for a new pair of shoes, so you’ll want to make sure you’re asking all of the right house hunting questions to get the information you need. Many of your questions should focus on potential problems and maintenance issues. For example, you can ask questions like whether anything needs to be replaced, or what things require ongoing maintenance like paint, roof, heating and AC, appliances and carpet. Also ask about the house and neighborhood, focusing on quality of life issues, like whether there has been any recent crimes in the neighborhood. Be sure the seller’s or real estate agent’s answers are clear and complete, and ask questions until you understand all of the information they’ve given. Making a list of questions ahead of time will help you organize your thoughts and arrange all of the information you receive. Using an online house buying scorecard can help you develop your question list and keep a record for each potential home. 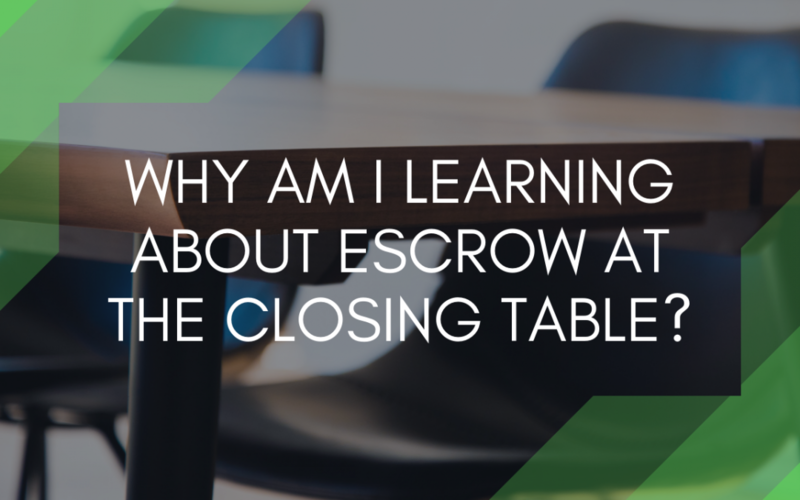 In case you missed it, check out our last Title Junction post: Why Am I Learning About Escrow at the Closing Table? Why Am I Learning About Escrow at the Closing Table? At Title Junction we strongly encourage consistent and concise communication between all parties involved in each individual real estate transaction. It’s important to maintain communication not only to reach the preferred closing date but to make sure that you are aware of what you’re agreeing to, whether you’re buying or selling. Although all involved parties do their best to provide you with the best information, you may still reach the closing table confused about impound accounts. An impound account, also referred to as an escrow account, is set up by your lender. This account pays extraneous property-related fees on your behalf. These fees may include things like your homeowner’s insurance or property taxes. These bills can be inconsistent with both timing and amount due. To help with this, homeowners can choose to pay fees in small payments with their monthly mortgage through an impound or escrow account. This way the bills are spread out while payments are made on time. This information is extremely important because if your loan does not include an escrow account then it is up to you to plan to pay these fees on your own without the additional help and management that impound/escrow accounts offer. Furthermore, if an escrow account isn’t featured in your loan then don’t be afraid to request one from your lender. Keep in mind that this account may make things easier financially for you and your family. The purpose of an impound or escrow account is to increase predictability. If the payments increase, then they will increase in installments rather than a huge unexpected bill that puts you behind. Not sure if your lender has included it or how it works? ASK YOUR LENDER! At Title Junction we want our buyers to sign their final documents with confidence in their financial status. When we reach the closing table and buyers are unaware of these fees that could have been tied to an impound account, we have to take a step back and enhance the communication that should have already been established between the lender and buyer.